If you like the idea of the slip case which comes supplied with the non-Surf EEEs, but want something which offers more protection, and a whole load more personality, you are going to be more than interested in the Fabrix cases for the EEE… Certainly not for the shy, retiring types, the two cases which I have are nothing short of beautiful, even if colours and patterns are not necessarily to everyone’s tastes. The cases come in two types: the basic “sleeve” case, and the “Delux case”, which is similar in design to that of Asus’ supplied slip case, with a couple of additions. 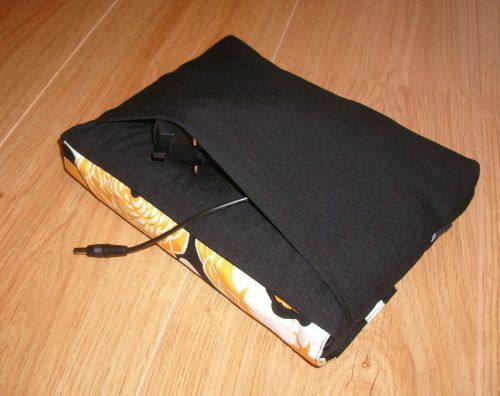 Whereas the Asus case is made of thin fabric, each of the Fabrix cases is padded- it is heavily cushioned, which should offer the EEE increased protection against accidental bumps and knocks. It remains, however, a fabric case, so I would not expect it to save the EEE from a substantial drop, or a particularly hard life – for my day to day travelling (both walking to the office, when I just put the EEE, in its case, into a larger bag, and also flying to various countries, in which case it comes with me as hand luggage), it would be more than sufficient, but, I’d probabaly prefer something a little more solid for a hiking holiday etc, although, as the EEE is a pretty robust machine of its own right, you may well be absolutely fine. Fabrix is very upfront and honest about this – the cases as described as protection against “scratches and light bumps”. The fit is very good – these cases are clearly designed for the EEE. 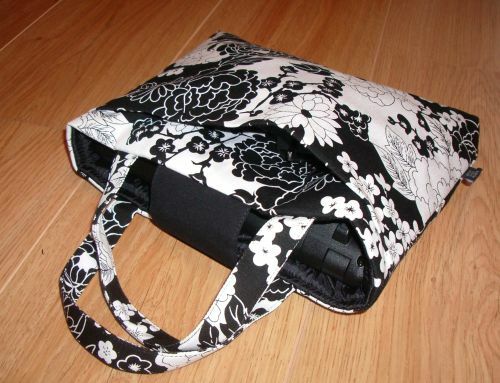 With the flip-over top / retaining strap in place, the EEE is held very snugly; there is no room for movement. Equally, this means that there is no room for accessories; whilst it might be possible to slide a portable harddrive into the case, you do run the risk of scratching the EEE, as there is no interior partition, or space for one. There is, however, a small pocket on the back of the case – this is fine for a small notebook, or a CD, spare SD cards etc, but nothing more than that. At a push, you could fit your AC adapter, but, I personally wouldn’t do this myself, as it would ruin the lines of the case. The Delux case has a “traditional” flip-over top (very similar to the supplied case), which fastens securely with Velcro. The style offers greater protection over the sleeve, as the EEE is completely enclosed. However, it is not possible to add handles to this design. In short, it is a padded and brightly-coloured version of Asus’ slipcase. It’s priced at just under $39. The Sleeve style has a small flap, for holding the EEE in place; this does secure the EEE, but, leaves the edge somewhat open to the elements; the flap covers around a third of the top of the EEE, as the photograph more clearly shows. 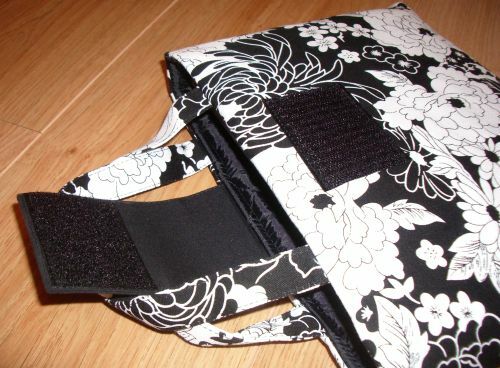 The key difference of this style, however, is the ability to customise the case to your requirements- you can choose whether the case is landscape or portrait (portrait would offer greater protection, as there is less EEE exposed), whether it has a back pocket (similar in design to the back pocket on the Delux model) as well as the option to add handles (long/short, fabric/leather) to either side of the flap. 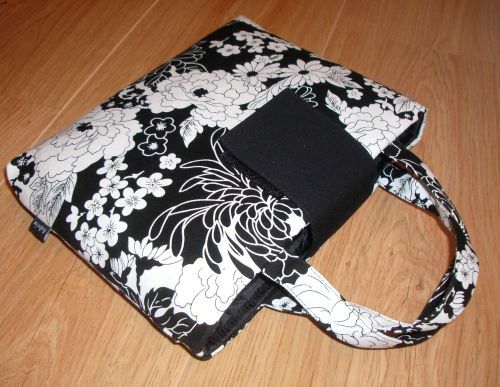 This turns the case into a handbag, which might make it less appealling to some, but, it’s entirely optional. 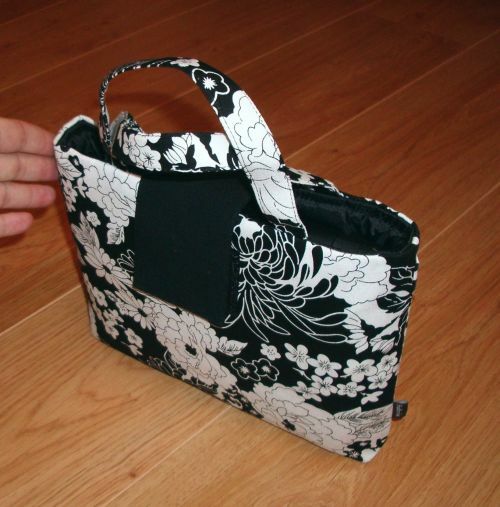 The handles are firmly attached, so I’d be confident carrying the EEE around in this case, and, for those who tend to carry a handbag, this could be an attractive option. Without any options, the case is just under $33; the case as shown in my photographs had small fabric handles and a back pocket (it was horizontal, for the record, but that does not change the price), and is just under $53. 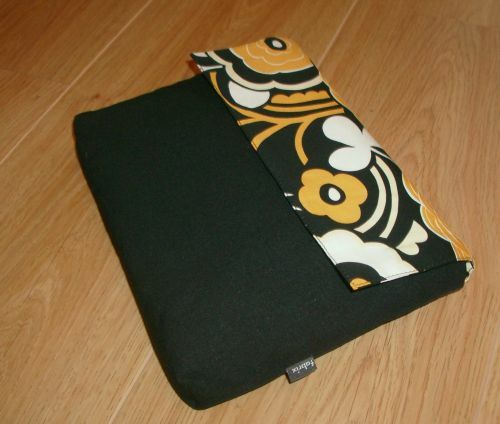 It is, without question, the fabric which makes these cases unique – whilst I have not gone out looking, I cannot recall seeing any laptop cases that look anything like these at all. Whilst the patterns and colours pictured here may not appeal to everyone, there is little doubt that they are stunning, with vivid colours and designs; they are beautifully made, and, according to the packaging material, “handcrafted.” I find that the EEE is a very personal device, because it is so small, and I tend to carry it round with me (like my smartphone), and, as such, I think there’s a good argument for having a case which is just as personal – there are plenty of generic, boring cases on the market, so, having something which stands out may be no bad thing. Fabrix supplies the cases in a variety of designs, so, there should be something to suit most tastes, with a very smart-looking pin-stripe being the most conservative. Here, the Delux case is “Black Amber”, and the Sleeve is “Black Flora”. The Fabrix cases offer the benefits of padding (which does, it must be said, add a fair bulk to the case), and, optionally, handles, but, most of all, offers a degree of personality which the corporate Asus case cannot hope to match. With the fully-customised sleeve (the more expensive of the two cases here) at approximately £27 at today’s exchange rate, the prices are not cheap, but neither are they unreasonable- these cases are well-made, with solid stiching and good construction. Shipping is an extra $9, so this should be factored in also – however, as the cases come from Singapore, this is not excessive, in my opinion. If you want a case for your EEE which is aesthetically somewhat out of the ordinary, Fabrix could well be the case manufacturer for you. This review was prepared with samples supplied by Fabrix Cases. You can purchase the cases directly from the Fabrix website, or else find details of resellers. This entry was posted on Monday, January 28th, 2008 at 8:31 am and is filed under Reviews. You can follow any responses to this entry through the RSS 2.0 feed. You can leave a response, or trackback from your own site. I have been using my Fabrix case for a few weeks now, and apart from not having space for the charger I find the case is adequate protection and storage for my Eeee and USB stick etc. 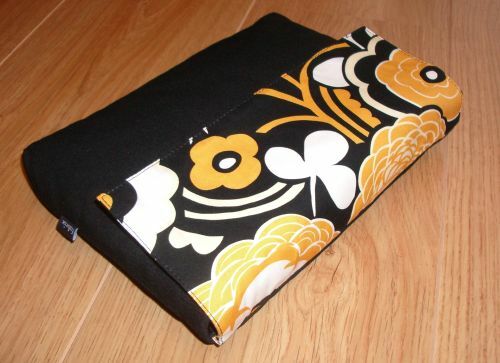 I also purchased a matching ipod case which was an offer on the Fabrix website which now houses my mobile phone. Definatly recomended.